Before I anounce the winner I would really like yo thank you all so much for entering - I can't believe the response that I had!! I have almost 200 followers now :) Incredible! 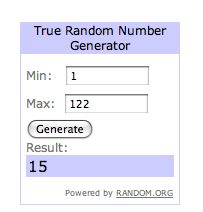 And who was lucky number 15 you ask? Massive congratulations to Laurenrhiannon - I will shoot you an email this evening, and if you could send me your details (address etc) I will get your prize out to you as soon as possible! !